Jacob August Riis was born on this day in Ribe, Denmark, on 3rd May, 1849. Today is the 164th anniversary of his birth. 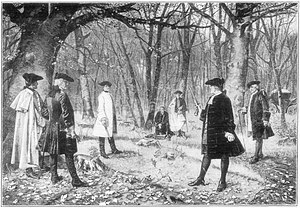 Jacob was the third of fifteen children born to Niels and Carolina Riis. His father was a schoolteacher who occasionally wrote for a local newspaper. Jacob read as much as he could. 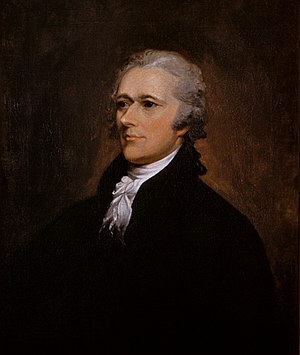 He tried to sharpen his English skills by reading James Fenimore Cooper and Charles Dickens. Although Niels had hopes of his eldest son becoming a writer, Jacob wanted to be a carpenter. After completing his apprenticeship in Copenhagen Riis returned to Ribe but found it difficult to find a job. So, in 1870, with help from some friends he decided to emigrate to America. The job market in America was no better than it was in Copenhagen. Riis lived hand to mouth (at best) spending his nights at police station lodging houses, in a graveyard, and when he could afford it in one of New York’s overcrowded, dark, airless, tenements. He took on any odd job he could find from day laborer, to farmhand, to bricklayer, and, occasionally as carpenter or writer. When his money ran out he begged, scavenged, ate handouts from restaurants and stole fallen apples from orchards. France had declared war on Germany in 1870 (the Franco–Prussian War) and he wanted to volunteer for the French side to avenge earlier Prussian aggression in Denmark. But he was never able to hook up with a group traveling back to Europe to fight. He developed a writing style that was expressive, dramatic and to the point. 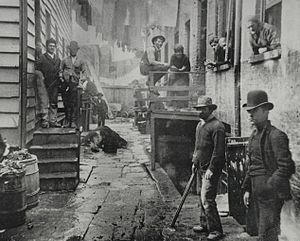 although his writing was raising awareness of the plight of the poor, he didn’t think it went far enough in illustrating the dire conditions of the slums of New York. He needed to SHOW the upper and middle class what was going on in the tenements. His first attempt was through sketching, but he quickly realized he didn’t have the artistic skills for that, so he switched to photography. He embraced the use of flash powder photography and brought his camera into the dark tenement buildings and the alleys at night. The lecture tours lead to a an article in the 1889 Christmas edition of Scribner’s Magazine. The 18 page article, titled “How the Other Half Lives” turned into a book by the same name, published in 1890. 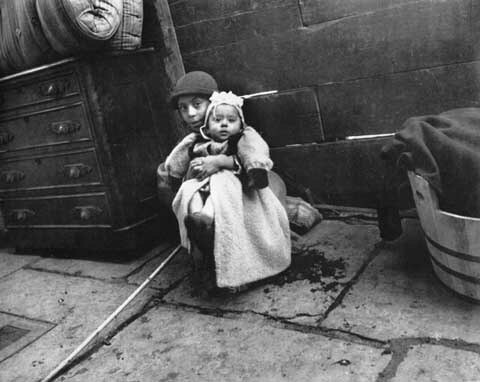 Children of the Tenement (1903). Riis died on May 26, 1914. 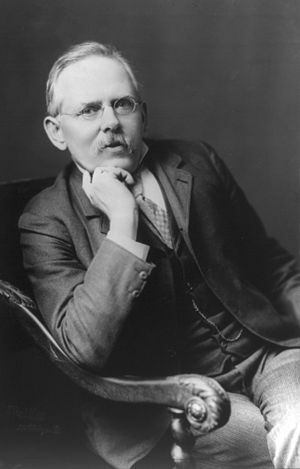 Seaside Park in Rockaway, New York was renamed “Jacob Riis Park” in his honor. A nod of thanks to my fabulous hubby who pointed out Riis as a possible Thought of the Day candidate. Good pick, hon. George Herman Ruth was born on this day in Baltimore, Maryland, USA in 1895. Today is the 118th anniversary of his birth. He was one of eight children born to George and Kate Ruth. Only he and his sister Mamie survived. 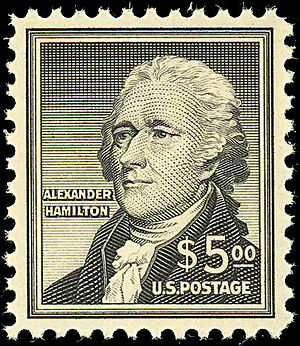 His parents ran a saloon at 426 West Camden Street, a job that took much of their time. So George, Jr and Mamie were left to their own devices. As an adult Ruth reflected that he ran the streets as a kid, skipped school, chewed tobacco and drank beer while his father wasn’t looking. He was “incorrigible,” and that’s what his parents recorded on his entry documentation to St. Mary’s Industrial School for Boys when he was sent he was just 7 years old. St. Mary’s was part reformatory, part orphanage, part school and part work house. It was run by the Xavier Brothers and it served boys from ages 5 to 21. Ruth learned to make shirts as well as carpentry skills at the school. He lived there for 12 years. His parents seldom had the time to visit the school. Fortunately for Ruth, the prefect of discipline at St. Mary’s, Brother Matthias Boutlier, took him under his wing. 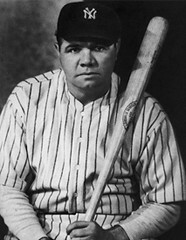 The nickname stuck and he was known as Babe Ruth from then on. The following year he shifted his focus to his hitting game and earned a new record. This time for a whopping 29 home runs in a single season. 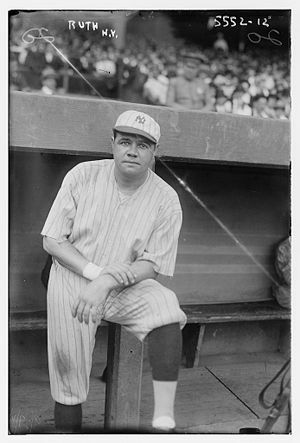 Ruth was traded to the Yankees in 1920 and topped his home run tally (coming in at 54 for the year.) 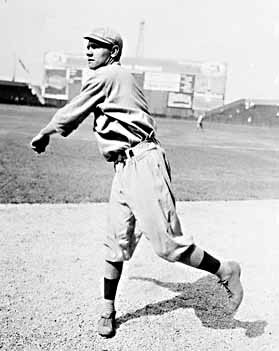 In 1921 he broke the record again with 59 home runs. In 1927 Ruth, as part of the Yankees famous “Murderer’s Row” hit an amazing 60 home runs for the season — a record that stood for 34 years. and highest slugging percentage for a season (.847). 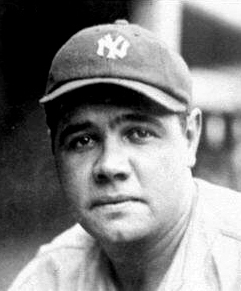 Ruth helped the Yankees win seven pennants and four World Series. He wore pinstripes until 1934. He was ready to retire from the active roster and wanted to manage, but his off-field hijinks — he was almost as famous for his love of alcohol, women and food as he was for his ability to swing a bat — made owners think twice about placing him in a supervisory position. He was traded to the Boston Braves for his final season where he hoped to have both playing and assistant-management duties, but he soon realized the “management” part of his job was mostly P.R., public appearances and giving autographs. The Sultan of Swat, The Bambino, Number “3” (Babe’s number in the Yankee batting line up and eventually the number on the back of his pinstripes) was inaugurated into the Baseball Hall of Fame in 1936. A decade later doctors discovered a tumor on his neck. Ruth had cancer. He died on August 16, 1948. 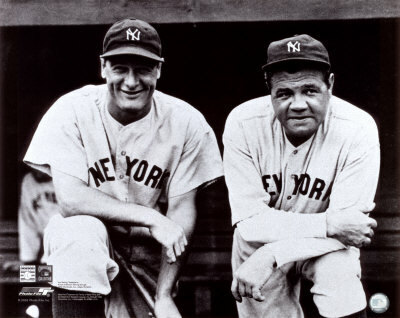 #4 Gehrig and #3 Ruth were the heart of Murderer’s Row and the Yankees. Sigh, it kills this Baltimore Orioles girl to write “Y – A – N – K – E – E -S” so often in a post. Please know I could only do it for the Babe (and for Lou Gehrig when it is his turn). When is Brooks Robinson’s birthday? Laura Leggett Linney was born on this day in New York City, New York, USA in 1964. She is 49 years old. Linney is the daughter of Romulus Linney, a playwright, and Miriam Perse, a nurse. Her parents divorced when she was an infant and she grew up in a modest 1 bedroom apartment with her mother. “Linney grew up working in the theater, both behind the scenes and, in her late teens, on the stage.” [Starpulse.com] After graduating from Northfield Mount Hermon School, a New England prep school, she went to Northwestern University and Brown University for undergraduate work. (She received her BA in Fine Arts from Brown in 1986). She did post-graduate work with Group 19 at the Juillard School. She took the stage in such Broadway productions as The Seagull, Six Degrees of Separation and Hedda Gabler before making the leap to film. Linney’s screen debut was a minor role in Lorenzo’s Oil. She played Kevin Kline’s mistress in Dave, and landed the role of Mary Ann Singleton in Armistead Maupin’s Tales of the City (a role she would reprise two more times.) She played in a trio of thrillers, Congo, Primal Fear and Absolute Power, before getting her big break as Meryl Burbank in The Truman Show. 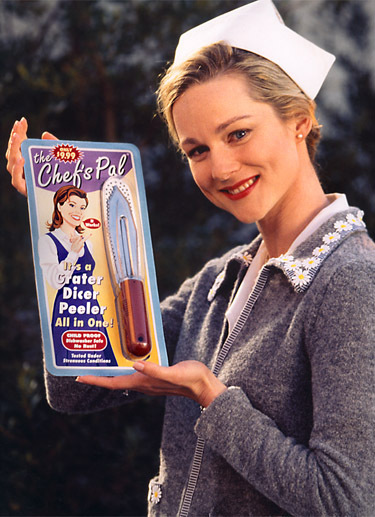 Linney played the “perfect wife” in Truman. 2000’s You Can Count On Me earned Linney her first Academy Award nomination for Best Actress. (Her second nomination was for her work in 2004’s Kinsey opposite Liam Neeson.) Also in 2000 she did the lush, delightful The House of Mirth (based on the Edith Wharton novel, with Gillian Anderson, Eric Stoltz and Elizabeth McGovern). Linney won an Emmy Award for her work on Wild Iris opposite Gena Rowlands. She won another Emmy, this time for Outstanding Guest Actress in a Comedy Series for her story arc as Charlotte on the TV show Frasier. She played Zelda Fitzgerald in American Master’s F.Scott Fitzgerald: Winter Dreams. She worked on ensemble films including Love Actually and The Laramie Project. She’s equally stunning as the intellectual mom struggling as her family crumbles around her in the Squid and the Whale as she is in the supernatural thriller The Mothman Prophecies as small town police officer. She brought Abigail Adams to life with her beautiful, strong portrayal of our second First Lady in HBO’s mini-series John Adams. Linney won her most recent Emmy Award for her efforts. She can currently be seen on Showtime’s The Big C — for which she won a Golden Globe — and as the host of Masterpiece Theatre on PBS. Her latest film role is as Margaret “Daisy” Suckley in Hyde Park on Hudson opposite Bill Murray’s FDR. 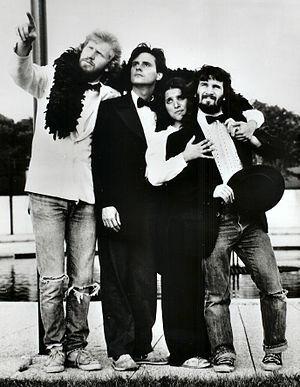 Julia Scarlett Elizabeth Louis-Dreyfus was born on this day in New York, New York, USA in 1961. She is 52 years old. Louis-Dreyfus was born into a wealthy family. Her father, Gerard Louis-Dreyfus, is a billionaire and the chairman of Louis Dreyfus Energy Services. Her mother is a writer. They divorced with Louis-Dreyfus was a baby and she went with her mother to live in Washington DC. 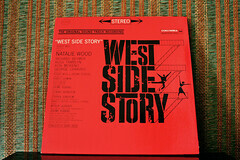 She studied acting at Northwestern University. She worked with Chicago’s Second City comedy group before moving to New York and joining the cast of Saturday Night Live for a three-year stint from 1982 to 1985. She left the show to do movies — landing supporting roles in Hannah and Her Sisters, Soul Man, and North among others, and to do prime time TV. She co-starred in Day by Day for that show’s two season run, and did a number of guest spots. She won her first Emmy award for the role in 1996. 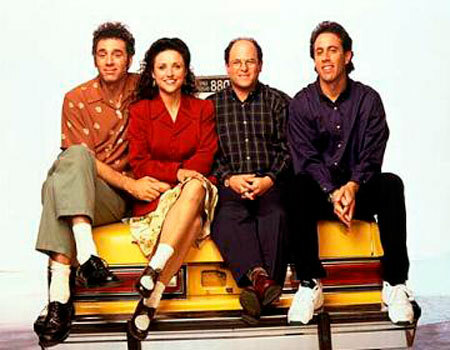 The show ran for nine seasons. After Seinfeld she starred in the short-lived comedy Watching Ellie with fellow Second City alum Steve Carell. She had recurring rolls on high profiles shows like Arrested Development, The Simpsons and Curb Your Enthusiasm. She won her second Emmy for her next sit-com, The New Adventures of Old Christine which ran for 5 seasons. 2012 saw her starring in a new series, HBO’s Veep. Louis-Dreyfus won her third Emmy for her role as Selina Meyer. She is a co-producer for the series.